The HRB Centre for Primary Care Research (www.hrbcentreprimarycare.ie) hosted an international collaborative Knowledge Exchange and Dissemination meeting on: “Potentially Inappropriate Prescribing: Epidemiology, Interventions and Policy Implications” on Tuesday 26th November in RCSI. 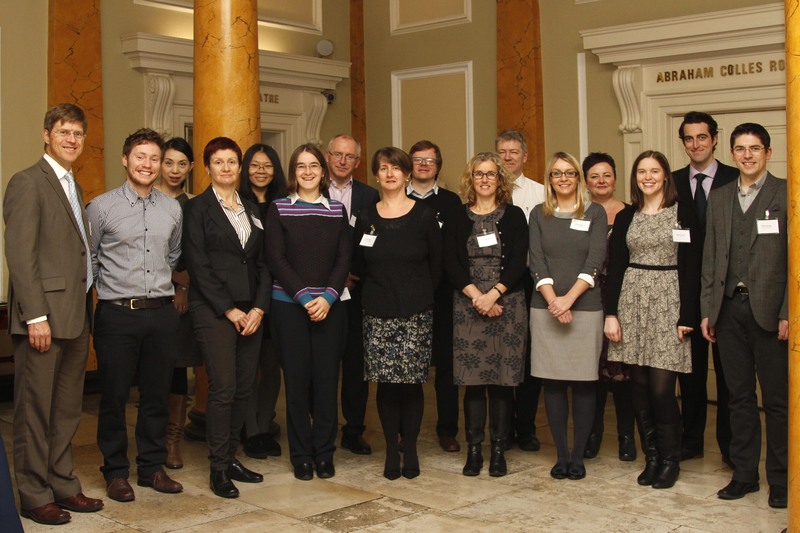 The meeting summarised recent activities in the area of potentially inappropriate prescribing (PIP) and consisted on a number of focussed presentations from researchers at the HRB Centre for Primary Care Research, Queen’s University Belfast and the Universities of Nottingham, Manchester and Dundee. These talks related to the development of prescribing indicators to enhance quality, safety and cost-effectiveness of prescribing, practice based interventions including academic detailing and decision support for clinicians, and health policy implementations to reduce PIP. The meeting was attended by national and international academics, clinicians and policy makers with an interest in effective medicines monitoring. 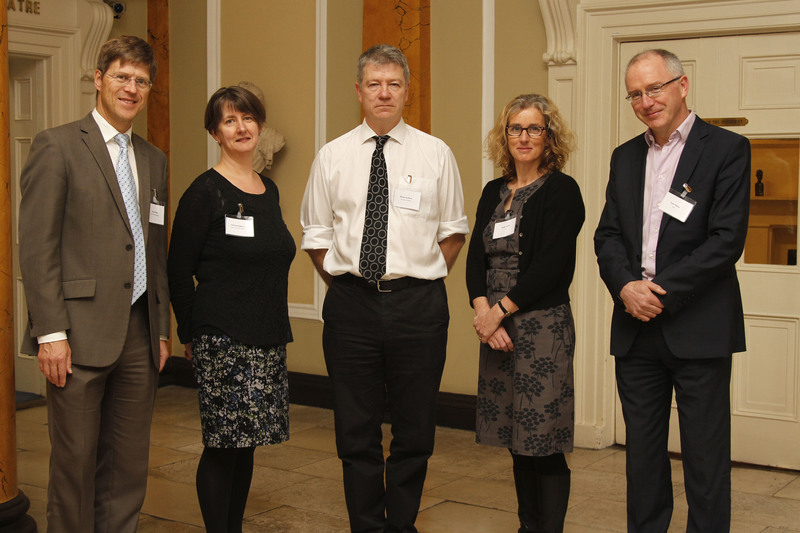 Photo caption: Speakers at Tuesday’s meeting on potentially inappropriate prescribing, hosted by the HRB Centre for Primary Care Research. Professor Tony Avery, Head of School of Community Health Sciences, Division of General Practice, University of Nottingham. Dr. Ronan Mc Donnell, Post-Doctoral Research Fellow, HRB Centre for Primary Care Research RCSI. Professor Rachel A Elliott, Lord Trent Professor of Medicines and Health, School of Pharmacy, University of Nottingham. Dr. Rachel Spencer, Academic GP, PhD Candidate in the Primary Care at the University of Nottingham, Professor Carmel Hughes, Professor of Primary Care Pharmacy, Queens University Belfast. Professor Susan Smith, Associate Professor of General Practice, RCSI. Dr. Janine Cooper, Post-Doctoral Research Fellow, School of Pharmacy, Queen’s University Belfast. Barbara Clyde, PhD Scholar in Health Services Research, HRB Centre for Primary Care Research RCSI. Dr. Dan Morales, CSO Clinical Academic Fellow, University of Dundee. Xinyu Zhang, PhD Student, University of Dundee, Ning Yu, Post-Doctoral Research Fellow, University of Dundee. Professor Tom Fahey, Professor of General Practice RCSI and Principal Investigator for the HRB Centre for Primary Care Research. Dr. Tobias Dreischutle, Research Fellow(Pharmacy), University of Dundee. Professor Bruce Guthrie, Professor of Primary Care Medicine, University of Dundee. Dr. Sarah Rodgers, Senior Research Fellow, School of Medicine, University of Nottingham. Dr. Patrick Redmond, General Practicitioner, Lecturer & PhD Scholar in Health Services Research, HRB Centre for Primary Care, RCSI. Photo caption: Session chairs at Tuesday’s meeting on potentially inappropriate prescribing, hosted by the HRB Centre for Primary Care Research. Professor Tony Avery, Head of School of Community Health Sciences, Division of General Practice, University of Nottingham. Professor Carmel Hughes, Professor of Primary Care Pharmacy, Queens University Belfast. Professor Bruce Guthrie, Professor of Primary Care Medicine, University of Dundee. Professor Susan Smith, Associate Professor of General Practice, RCSI. Professor Tom Fahey, Professor of General Practice RCSI and Principal Investigator for the HRB Centre for Primary Care Research.